Cette vieille maison en pierre soigneusement restaurée est idéale pour les grandes entreprises. Avec une grande terrasse, jardin et piscine disponibles pour profiter de la vue magnifique sur la vallée de Lim. Situé dans le centre de la ville avec tous les services à portée de main, mais offre une intimité totale. Une position centrale de la maison en Istrie fournit un accès rapide à la côte et en fait une base idéale pour l'exploration de tous les plaisirs que cette région offre. Il y a aussi le service de chef professionnel qui est inclus dans le prix de location (petit déjeuner + déjeuner ou dîner - 2 repas par jour ... épicerie facturé au coût, le menu est fixé un jour à l'avance). Wir waren in der ersten Oktoberwoche in der Villa Gigi und es hat uns sehr gut gefallen. Wir waren 15 Erwachsene und 4 Kinder. Der Außenbereich ist super, Pool ausreichend groß, es gibt ein Beachvolleyballfeld und ein Trampolin, die Terrasse ist abgegrenzt, was vor allem die Eltern gefreut hat. Der Innenbereich ist großzügig aber dunkel, die Feuerstelle haben wir rege genutzt, da es zu der Jahreszeit doch abends kühl wird. Die Zimmer sind das einzige, was nicht ganz unseren Erwartungen entsprach, relativ dunkel und zu der Jahreszeit ein wenig feucht. Das Beste an der Villa ist aber die Ausstattung mit Bierzapfanlage, professioneller Kaffeemaschine und vor allem mit Gigi, der uns jeden Tag wunderbar bekocht hat (Frühstück und Abendessen). Vor allem das Abendessen war super-lecker und abwechslungsreich, Gigi macht alles möglich, von Fisch über Meeresfrüchte, Schnitzel mit Pommes, Grillplatte und so weiter. Das Ganze für einen sehr guten Preis (wir zahlten 100 EUR pro Person für die ganze Woche täglich Frühstück und Abendessen). Das Essen war bei Gigi besser wie in den meisten Restaurants, in denen wir teilweise zum Mittagessen waren, wenn wir unterwegs waren. Wir haben uns gefühlt wie im Hotel nur besser. Insgesamt ein sehr erholsamer Urlaub, der in guter Erinnerung bleiben wird. Wow - what a Villa and what a holiday! We arrived with 19 people, our entire family, and we had ages from 6 to 70. The 14 days flew by and without exception we were sad to leave this happy place. The kids would start the day by jumping into the pool soon followed by many adults. After a delicious breakfast, expertly prepared by super host GIGI, we would explore the beaches in the area as well as many other attractions. Having discussed the evening menu, Gigi would do all the shopping and deliver a mouthwatering evening feast for a very reasonable amount of money. We did also, on occasions, eat in restaurants but honestly the meals 'at home' were bigger, better, cosier and cheaper including tasty adaptations for vegetarians etc. A real treat!!! Yoga in the garden, team volleyball or simply looking at the breathtaking view during the day or the moon at night were all part of the Croatian experience. We even slept 'sur la belle etoile'. Gigi was always happy to help, offer suggestions or even lend a drill bit to make a shell necklace with the kids. He organised a wine tasting in a neighbouring village where we bought rather large quantities as well as his own homemade olive oil. in a word 10/10 - wholly recommended.! We are a big family from Estonia of 12 grownups and 6 children (age 3-10) in our group and just left villa Gigi. We have had quite many villa vacations before, but this was special because of the house boss Gigi. He was very friendly, helped us to book winery tour and gave other recommendations. But most of thank goes to the cooking. All the meals were very delicious and we didn't need to do anything. Everyone were waiting for the next dinner, that with witch food are Gigi going to surprise us, and we were very happy about everything. Plus all drinks: beer, wines, soft drinks and home made juice was always in the house. So during our stay, we didn't need to do grocery shopping at all. So we spent all our vacation just relaxing. 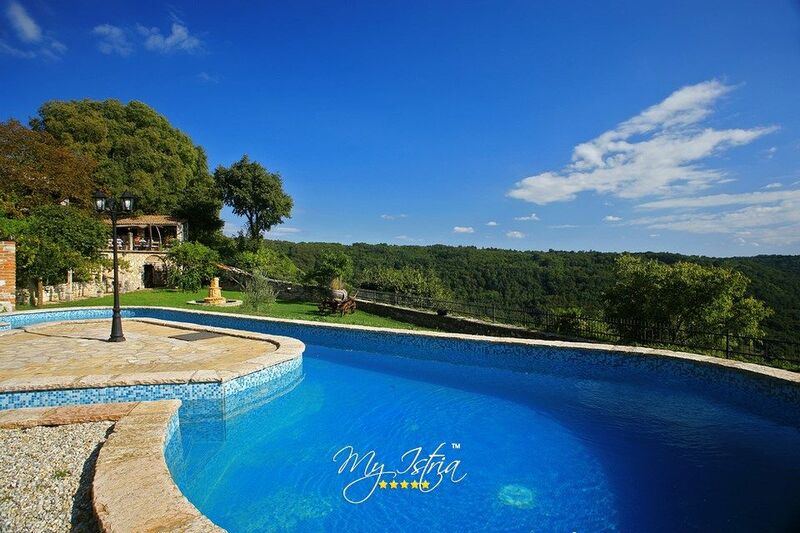 Villa Gigi in located in a very small village and have beautiful views on the valley. Easy to access and have friendly people around. Rooms are clean and every room has its own bathroom and air conditioning. Just in case. if You are allergic to bees, then take same medicine with you, because during our stay there were quite many by the pool. So we highly recommend this villa for a family vacations! Wir, das sind 8 Erwachsene, haben Anfang Juni 2018 1 Woche verbracht. Unsere Beanstandungen wurden zügig beseitigt. Als Entschädigung wurden wir bekocht und die zur Verfügung gestellten Getränke gingen auf's Haus. Das Außengelände ist sehr gepflegt und wir haben hier viel Zeit verbracht und den Urlaub genossen. Die Zimmer sind dunkel und die Badezimmer sind ohne Fenster und dazu noch sehr klein. Wir werden dieses Haus wohl nicht mehr buchen. Wir haben eine Woche im Mai mit der gnzen Familie bei Gigi verbracht. Es war wunderschön. Gepflegtes Haus mit viel Platz, Volleyballfeld und Pool. Gigi erfüllt jeden Wunsch und das Frühstück und Abendessen war super und günstig. Wir haben für Essen und Trinken 115Euro bezahlt pro Person für die ganze Woche. Das war ein absolutes Schnäppchen. We stayed with 16 persons in Villa Gigi for two weeks in July 2017. The location has a amazing view into the valley behind the villa. Mr. Voltic (Gigi) handle everything very obliging and friendly. He manage what ever you want to eat and drink. Having a breakfast (4 EUR) and a very delicious dinner (8-9 EUR) is absolutely no issue. We were in the lucky situation to have nice weather the whole time. We had all meals outside and have enjoyed the great view and the silence after visiting e.g. Porec. The bath rooms, need from our point of view, a refurbishment. Some of us have used e.g. the shower at the pool. Two day prior to our departure we had up to six scorpions in different bed rooms. Since this time the carefree sleeping was not that easy. La maison est située dans le village médiéval de Tinjan; avec toutes les commodités à distance de marche. La côte adriatique est à 20min avec les plages et les villes touristiques de Porec, Rovinj, Novigrad ... 45 minutes se trouve le parc naturel national des îles de Pula et Brijuni. De Porec, vous pouvez faire une excursion en bateau à Venise. Cette propriété est un endroit parfait dans le centre de l'Istrie pour les grandes fêtes. L'aménagement de bon goût, le jardin et la vue imprenable sur la vallée de Lim sont les facettes de la propriété. Le tarif hebdomadaire comprend: 7 nuits d'hébergement, le nettoyage initial et final, le service de chef professionnel (petit-déjeuner + déjeuner ou dîner - 2 repas par jour… courses payées au prix coûtant, le menu est fixé un jour à l'avance), blanchisserie (draps et serviettes), entretien de la piscine, entretien du jardin, gaz, eau, électricité, taxe de séjour, frais d'enregistrement, bois de chauffage, accès Internet haut débit, rendez-vous avec un panier de bienvenue composé de produits locaux. La maison est louée sur une base exclusive afin qu'aucun autre invité ne soit présent.